OK, so it isn’t pretty. But it does taste delicious! This was an impromptu dish, born of the fact that I had some leftover bread picada from the chickpea and spinach dish I made a few days ago, and some ‘use-me-now’, very ripe tomatoes I found at the greengrocer. Tomatoes aren’t really in season here, so I definitely want to repeat this dish in the late summer when the tomatoes are at their peak. It might look a mess and the tomatoes might be off season, but it tastes good. So good that I’ve eaten it three times in the last week. It will taste even better when the tomatoes are in season. Slice the top 1 cm off the top of each tomato. Remove the core from the slice. Using a teaspoon, scoop the inside pulp and seeds from each tomato and reserve. Season the inside of the tomatoes with salt and drop a basil leaf into the bottom. Fill the tomato with the bread picada and pour the reserved tomato liquid into the tomatoes avoiding as many seeds getting in as you can. It doesn't matter if some get by you. But seeds tend to make the mix more bitter. Put the tops back on the tomatoes and drizzle a teasoon of oil over each tomato. 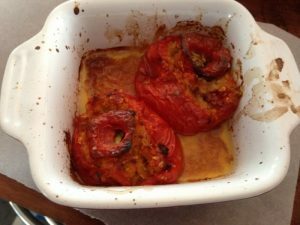 Cook in a 220°C / 425°F oven until the tomatoes begin to collapse, about 30 minutes.